I'm on a CAS roll and here is one using a Prairie Fairy image. Pardon the photo......I guess I took it on an angle and it looks like the brads are not straight, but they really are....lol. Copics were used to color this image. I added three brads from my stash on the bottom. Just precious! Thanks so much for joining us at The Sisterhood ‘Let It Snow’ challenge and please come back again soon! How sweet is this image!! It's adorable and you did a wonderful job of coloring it. Thanks for playing along with our snow challenge over at the Sisterhood. What a darling little fairy she is! Love that cute image and your CAS card. The little brads are just the perfect touch too. Thanks for joining us at Creative Belli Challenges. What a sweet image! Thank you so much for playing along with us at Cupcake Inspirations this week! Good luck! CAS is so tough, but yours is lovely! 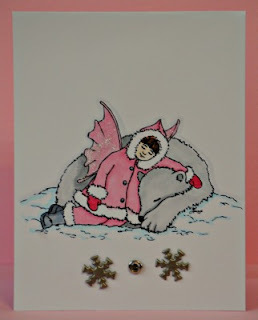 Thanks for playing along with our Let It Snow Challenge at The Sisterhood of Crafters! Absolutely gorgeous card.Little fairy image is very fabulous, she is looking cute bear.